The Enchiladas Del Puerto at Cebolla's Mexican Grill on Fernhill Avenue. The Queso Del Rancho at Cebolla's Mexican Grill on Fernhill Avenue. 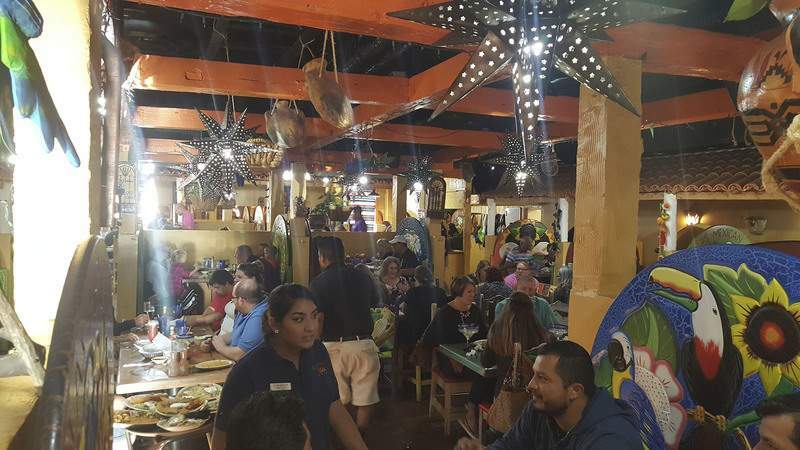 The atmosphere is festive at Cebolla's Mexican Grill on Fernhill Avenue. Carnitas at Cebolla's Mexican Grill on Fernhill Avenue. Arroz con Pollo at Cebolla's Mexican Grill on Fernhill Avenue. The Grilled Shrimp Taco Salad at Cebolla's Mexican Grill on Fernhill Avenue. 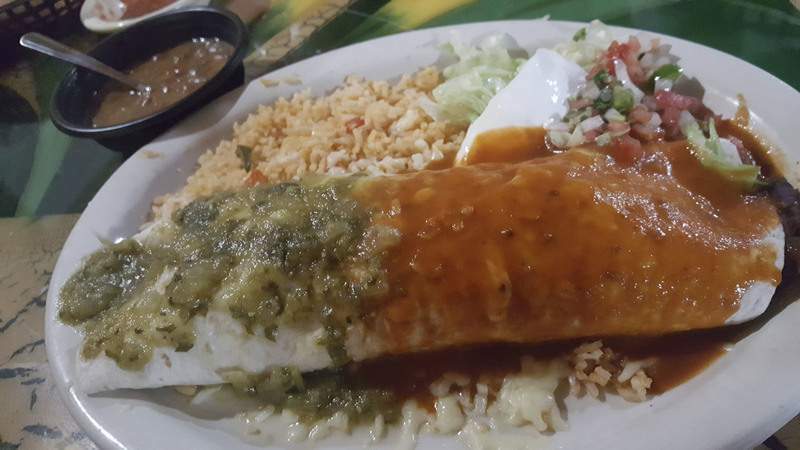 A Burrito Fajitas with red and green sauce at Cebolla's Mexican Grill on Fernhill Avenue. The Sopapillas with ice cream at Cebolla's Mexican Grill on Fernhill Avenue. 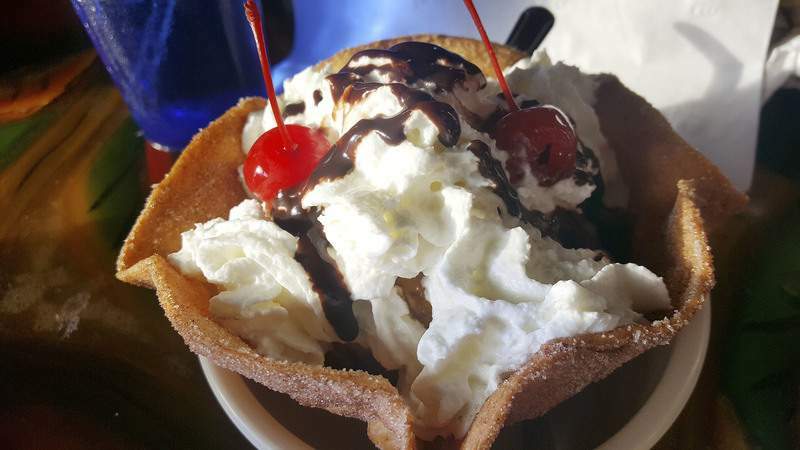 Fried ice cream at Cebolla's Mexican Grill on Fernhill Avenue. It took me back to my high school days, way before the boom of Mexican restaurants hit the Midwest. Back then, Chi-Chi's was all we really had for Mexican, and for one of my buddies, all he ever had there was the Cancun. 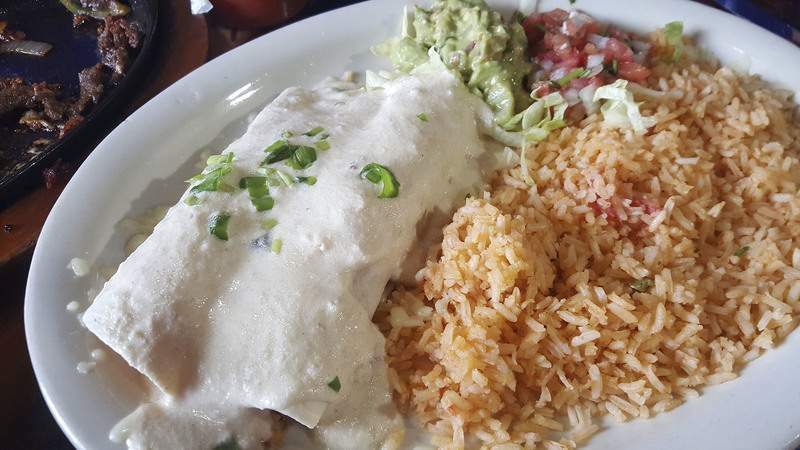 This seafood enchiladas dish was marked by its creamy white cheese sauce that was not at all spicy. He loved it and ordered it every time he went there. I liked it, too, and I would get it regularly up until Chi-Chi's faded away in 2004. 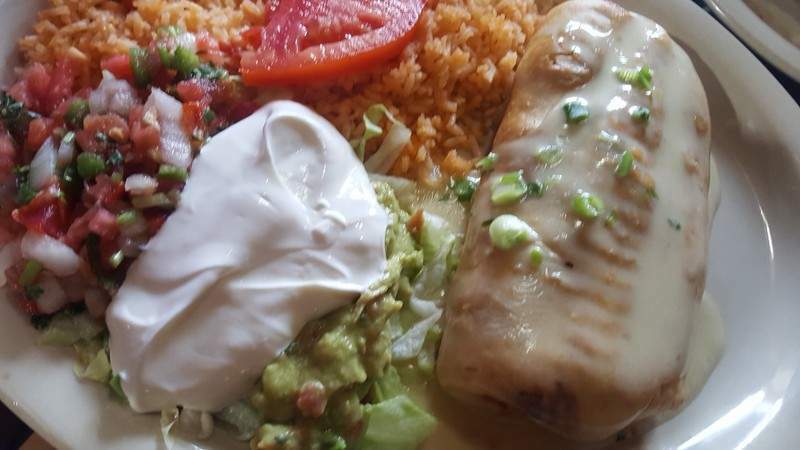 When I tasted the Enchiladas Del Puerto at Cebolla's Mexican Grill on Fernhill Avenue behind Glenbrook Square, the nostalgia took over. The flour tortillas were nicely filled with imitation crab, shrimp, green onions and celery. It had the right sauce – a mix of sour cream and queso – and pretty much tasted just like the old favorite. Cebolla's has sort of become a throwback of its own now that it is in its 16th year. The Fernhill store was followed by five others – four in Fort Wayne, including Don Chava's on Wells Street, and one in Auburn. 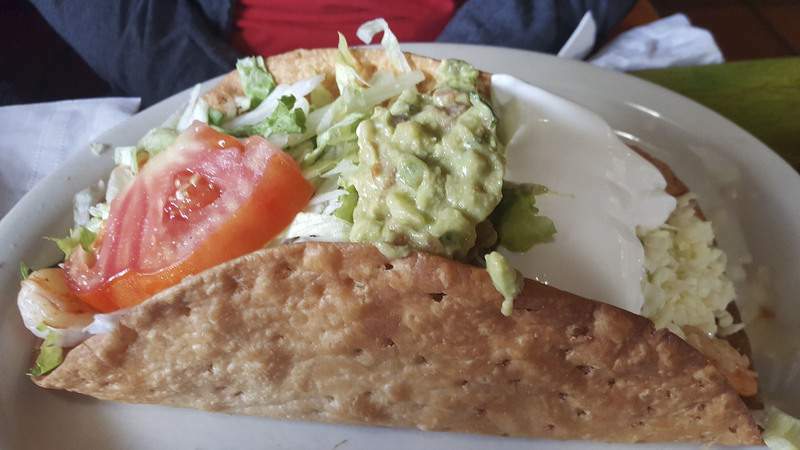 It is still one of the first places I recommend when asked where to go for solid Mexican and, as was the case with Chi-Chi's, I have been enough times that I have my own set of go-to dishes. But I had never had the Del Puerto, which told me I need to take more risks. An appetizer that was not at all risky ended up tasting as good as it sounded. 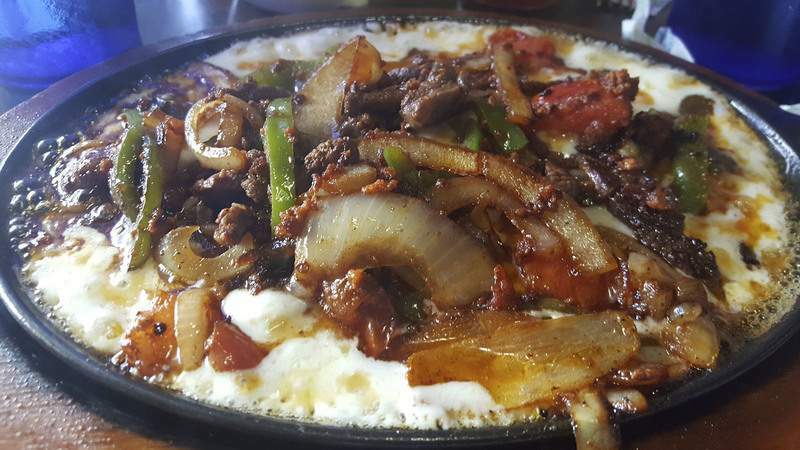 The Queso Del Rancho was a sizzling hot platter of mozzarella topped with chorizo, green peppers, tomatoes, onions and your choice of shrimp, chicken or steak, of which I chose the latter. It came with tortillas, but I liked scooping up this browned, gooey cheese blanket with some of my tortilla chips. The chorizo was mild so it did not take over, there was plenty of steak, and it was simply a perfect mix of goodies. It was a tad oily, but that was a small price to pay for its deliciousness. I did struggle to receive that tasty starter, however. Communication was a real issue during one visit, and I was first served a chorizo-spiked queso dip. The Del Rancho did arrive pretty quickly after the mistake was realized. Cebolla's queso dip was fantastic, as it always is, so maybe that chorizo one will be tried next time. The Grilled Shrimp Taco Salad was also a surprising find. There were a lot of medium-sized shrimp in it, and those shrimp were cooked with onions, peppers and tomatoes before being added to the salad, so they were still hot. When mixed with the cold lettuce, raw tomatoes, guacamole and sour cream on top, it created a wonderful contrast. Its bowl, which was actually more like an oversized taco shell that wrapped around the salad, was also freshly fried, so it was still warm, and it was very light and crispy. A couple of simple Mexican staples also proved to be worth making regulars in my rotation. 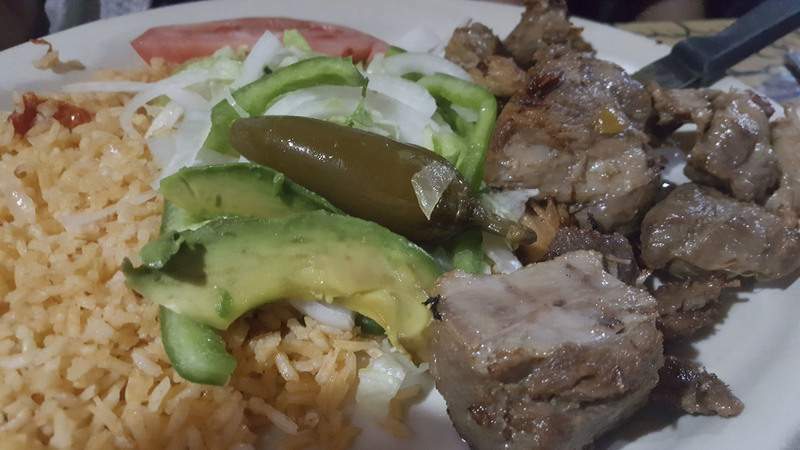 The carnitas meal had big chunks of fatty, fall-apart-tender pork roast flanked by refried beans, rice, and a mini salad of onions, tomatoes, lettuce and guacamole to add to each tortilla if you wanted. The pork was so good, it didn't really need any accents – or tortillas, for that matter – because it was perfectly seasoned with added flavor from the onions that I assume it was cooked with. I probably liked it best on its own, because I was a bit thrown off by how sweet the corn tortillas were. I inquired as to why they were so sweet, thinking they might have been specially made that way, but was told by a manager they were simply Mission brand tortillas that you can find at your grocery store. 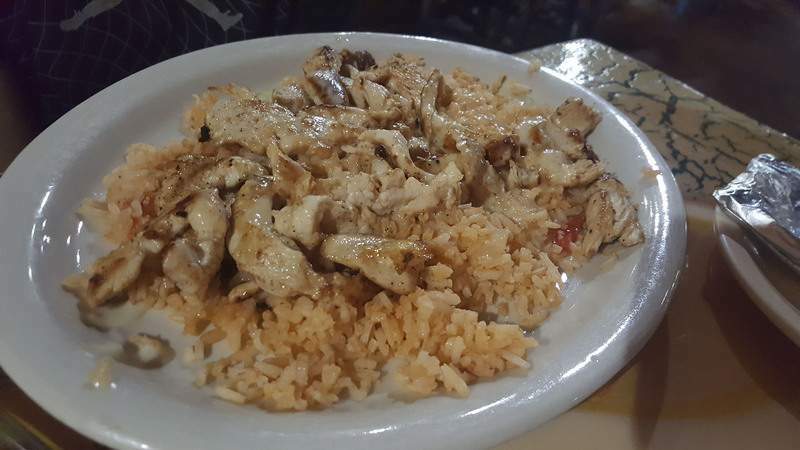 The Arroz Con Pollo – chicken and rice – was made brilliant by having so much of that delicious queso mixed into it. The chicken was tender and it, too, was nicely dusted with seasonings that simply accentuated it without making it spicy. There was something not right about all of the other things I sampled. The Burrito Fajitas, which I had with steak, had nice crunchy green peppers inside that made it pop a bit, but the steak was very fatty and unappealing. I had it with red and green sauce on top and liked how vibrant the tomatillo-based green was compared with the mundane red. It came with charro beans on the side, which were also pretty boring and actually not as good as the regular refried beans. I chose to have my chimichanga with “beef chunks” instead of shredded chicken and found those chunks to be fantastic. They were tender stringy pieces that reminded me of a good old-fashioned pot roast. The tortilla it was encased in was kind of leathery in texture. Had it been fried until crisp, it would have at least had a chance to maintain its texture when coated in that yummy queso. 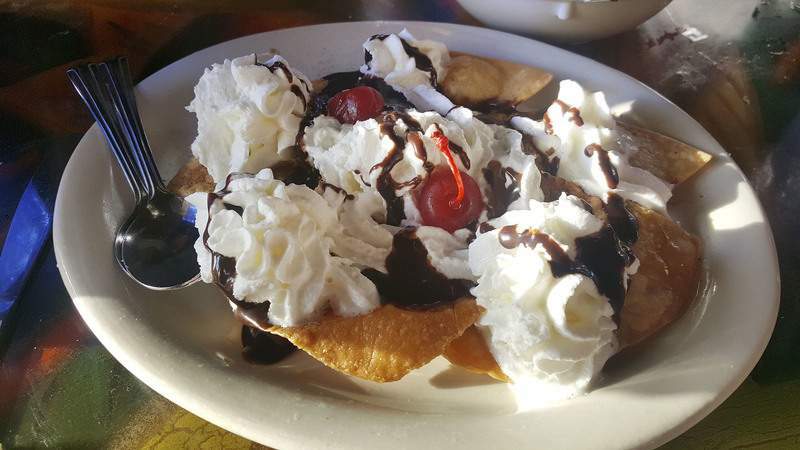 The desserts were a mixed bag, with pretty standard sopapilla beating the fried ice cream, which was coated in stale cereal and was still rock hard. It came in a little edible cinnamon-sugar tortilla bowl, but that bowl was jammed into a regular bowl that was way too small, making it hard to dig into. In contrast, the booth I was sitting in while trying to eat that fried ice cream was way too big. The bench was too far away from the table and forced me to awkwardly reach for each bite. Cebolla's was the first Mexican eatery in Fort Wayne to go with the dazzlingly colorful – but gaudy – decor featuring brightly painted oversized chairs and tables. And the place has not changed at all since it opened. It is not run-down or in need of major overhaul or anything, it is just not a novel look anymore.